According to the latest report – New Display Technology Cost Analysis – by WitsView, a division of TrendForce, Mini LED technology has made constant process over the past year, with a significant increase in production output (in unit per hour, UPH) and die bond accuracy. Looking ahead to 2019, WitsView expects a high possibility of the mass production of products with Mini LED backlighting. The processing costs of display units may increase by 20%~100% depending on the number of Mini LED used. According to Julian Lee, the Assistant Research Manager of WitsView, the number of Mini LED used in a display unit is decided by the thickness of the display and the luminance of the backlight unit. On one hand, the optical distance in the backlight unit is bound to be reduced to meet the market demand for thinner consumer electronic devices. On the other hand, the number of Mini LED needed for a single product remains high in order to maintain the high standard of optical performance. With decreasing the number of Mini LED used to be a possible way of cost reduction while keeping the products thinner, the manufactures may turn to increase beam angle as a solution. Current beam angle of Mini LED is around 120 to 140 degrees, and the epitaxy manufactures have been working on increasing the angle to 140~160 degrees. 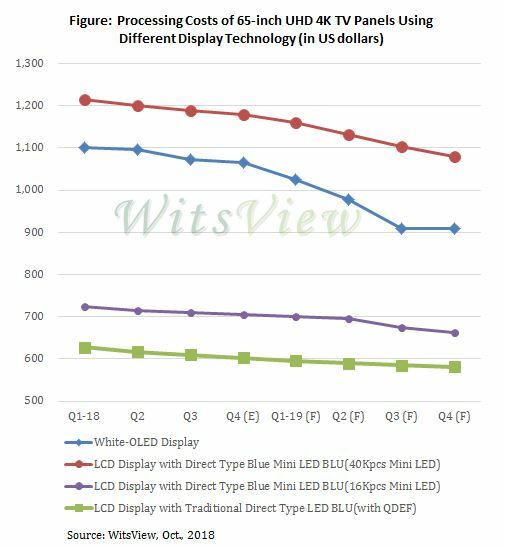 WitsView notes that Mini LED backlighting is still based on the traditional structure of LCD panels, aiming to enhance the luminance and HDR by increasing the number of LED used, while making the performance comparable to that of OLED displays. Taking a 65-inch UHD 4K TV panel as an example, the production cost of panel modules using high-end direct type LED backlight and quantum-dot enhancement film (QDEF) is probably US$600. As for the same size UHD with Mini LED backlight, which uses 16,000 LEDs, the production cost is around US$700. In case of 40,000 LEDs for better performance, the cost will rise to US$1200, 20% higher than an OLED TV of the same size and resolution. Therefore, it will be a key to the wide adoption of Mini LED in the market that how to overcome the technological hurdles while keeping the technology cost effective at the same time. Julian Lee had worked as a salesman in a panel maker for six years. With accumulated professional networking and hands-on experiences, he has been familiar with market prices’ trend. Therefore, he can provide multiple-dimension analysis toward the relations among panel costs, panel technology, and upstream components.